I'm extremely new to the iOS ecosystem, so apologies in advance. Error:Code Sign error: No provisioning profiles found: No non–expired provisioning profiles were found. It looks like in AppCode you are building for a device and in Xcode for a simulator. Simulator does not perform code signing, so you don't get an error there. If all you want to do is to run the app in a simulator, then in the toolbar change the selection from "iOS Device" to a desired simulator. To be able to sign the app you need to make sure that you have correct provisioning profile and certificate installed and check your codesign build settings. 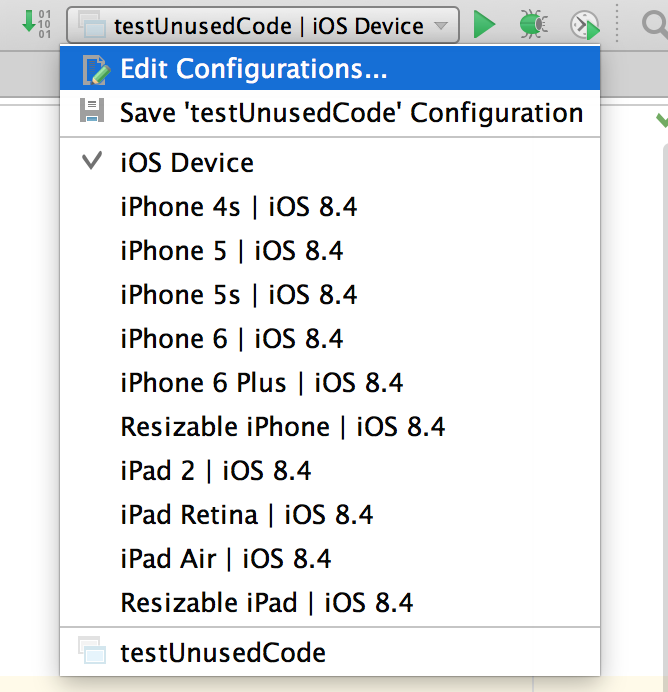 When I go to the toolbar to change the selection from 'iOS Device' to a desired simulator, there are none. How do I setup a desired simulator and where do I get one? XCode already comes with one right? How to I point AppCode to that simulator? You are right, you should change the build from device to simulator. You can do it in the upper right corner of the IDE. Hi, thanks for the quick response Anna. But I have the Application. That's what I want to run in the simulator. I guess I can't figure out how to wire AppCode up to a simulator via a Run configuration. Can you specify for on how to add a simulator to the Run configuration dropdown? Do you see iPhone and iPad types as on my screenshot (like iPhone 4s | iOS 8.4 etc)? These types actually are simulators Please try to choose one of them and run your application. If it doesn't work please attach your screenshot for this list. Geez -- thanks! That works! If you are not able to run the simulator or you are finding some errors in the code then visit AppleTech Support where you will get the correct code and steps to run the simulator correctly.